A parliamentary report of 1777 recorded parish workhouses in operation at East Haddon (for up to 20 inmates), Moulton (32), Old or Wold (21), Pisford (16), Scaldwell (12), Spratton (12), and Walgrave (10). County of Northampton: Boughton, Brington (2), Brixworth (2), Chapel Brampton, Church Brampton, Coton or Coaton, Cottesbroke [Cottesbrooke], Great Creaton, Little Creaton, Draughton, East Haddon, Faxton, Guilsborough (2), Hanging Houghton, Hannington, Harlestone, Haselbech [Haselbeech], Holcot, Holdenby or Holmby, Hollowell, Lamport, Maidwell, Moulton (2), Old or Wold, Pisford or Pitsford, Ravensthorpe, Scaldwell, Spratton (2), Teeton, Walgrave. Later Additions: Althorp (from 1861), Cold Ashby (from 1836), Mawsley (from 1862), Moulton Park (from 1862), Naseby (from 1836), Overstone (from 1894), Thornby (from 1836). The population falling within the Union at the 1831 census had been 12,461 — with its parishes ranging in size from Teeton (population 73) to Moulton (1,319). The average annual poor-rate expenditure for the period 1833-5 had been £11,388 or 18s.3d. per head of the population. 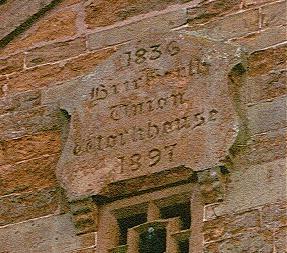 As was the case in a number of other Northamptonshire unions, influential local family interests had a hand in shaping the boundaries of the union. In the case of Brixworth, the Spencer family petitioned the area's Assistant Poor Law Commissioner, Richard Earle, to keep the whole of their estate within the union. Similar arrangements were made at Brackley (the Cartwright family), Daventry (the Knightleys), Peterborough (the Fitzilliams), and most notably at Potterspury where resulting union was unusually small, oddly shaped, and lacked a market town. 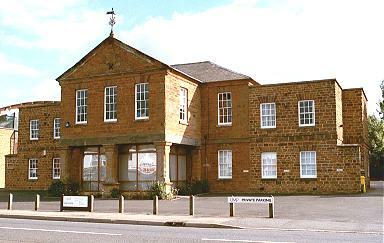 A new Brixworth Union workhouse was erected in 1835-6 in Brixworth and was designed by Mr Milne. In 1836, the Commissioners authorised an expenditure of £4,650 for construction of the building which was to accommodate 250. The workhouse location and layout are shown on the 1927 map below by which time it was officially known as Brixworth Poor Law Institution. The entrance block faced to the north and appears to have been extended to each side since its original construction. Only the centre of the front block survives and is now used as a medical centre. Northamptonshire Record Office, Wootton Hall Park, Northampton, Northants, NN4 8BQ. A wide variety of records survive including: Guardians' minutes (1835-1923, 1929-30); Births (1837-1920); Deaths (1837-1934); Creed registers (1880-1920); Admissions and discharges (1840, 1910-35); Punishment book (1889-1934); etc.